The Cook residence is another in a series of English Country style houses distinguished by a gently raked roof with a stone arched entrance. Located in Haddon Heights, the silver-grey stone is reminiscent of the houses from the English countryside with it’s finely crafted strapwork and stucco finishes. The house includes several fireplaces visible from the front of the house, the large twin chimney potts are supported by a brick mass atop the stone breast housing two fireplaces inside. Half dormers with Weathershield casement windows reduce the overall height of the house creating a more pleasing view within the neighborhood. 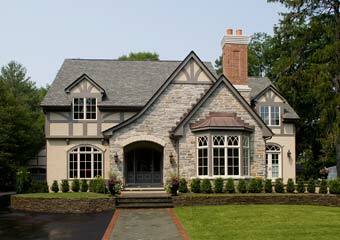 The roof was completed with “Grand Manor”, a slate look asphalt shingle material. The two car garage is detached but includes a covered walkway from the garage to the house rear mudroom entrance. Patios in traditional tudor pattern bluestone compliments the well designed landscape throughout. Designed with a first floor master suite, the house includes a gracious foyer with curved stair, front facing study with a copper bay window with tudor arched transoms and built in storage. 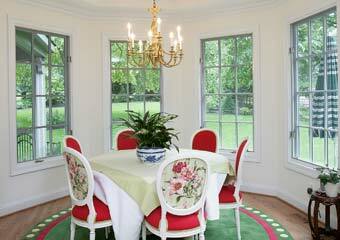 The dining room to the left opens to the large kitchen behind. Walking from the entrance, a large great room with vaulted ceiling, fireplace and custom TV unit on the right, with an open breakfast bar and kitchen to the left. At the back of the kitchen is a circular breakfast nook and mudroom entrance assessable from the entrance drive and covered walkway to the garage. The master suite on the main floor houses an additional study or home office, large master bath with fine appointments, walk in closets and vaulted ceiling sleeping quarters. Upstairs, the stairs are open to a balcony overlooking the great room below. The upstairs includes three additional bedrooms, an art room and two full baths. 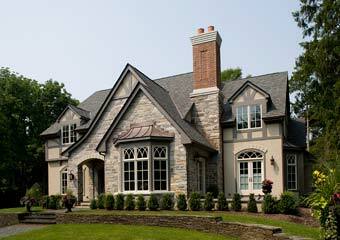 The house was constructed by Danley Builders of Moorestown. 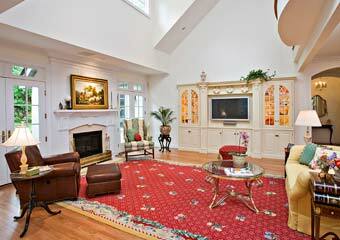 Interior Design by Lisa Knowlton of Haddon Heights.